Non-practicing entities (NPEs), or in other words, patent trolls, have attacked Apple the most (alongside HP and Samsung) during the past five years, according to Michael Brody, a Silicon Valley lawyer speaking at the Hot Chips conference at Stanford University on Tuesday (via TechHive, Tinh te). Considering that patents accounted for about 5% of all US exports in 2009 ($89.9 billion), and the number of chip patents — as measured by Winston & Strawn, an intellectual property company vice chaired by Brody — is rising at an accelerated pace (125,000 software patents are filed annually) this market attracts patent trolls. Suits fled against larger companies tend to demand higher amounts of damages; the mean resolution cost, including damages and the cost of the settlement, totaled $7.5 million for companies with over a billion dollars in revenue, and $7.8 billion for those over $10 billion in revenue. And the number of lawsuits is high: last year alone more than 4,200 separate companies or individuals were sued by NPEs. And the harm they cause looks like this if we convert it to money: in total, the annual cost or “troll tax” for defending NPE lawsuits is $1.04 million annually for those firms with annual revenue under $1 billion, to up to $57.67 million for those with revenues over $50 billion, Brody highlighted. You may recall that a company recently successfully settled a lawsuit with a patent troll. 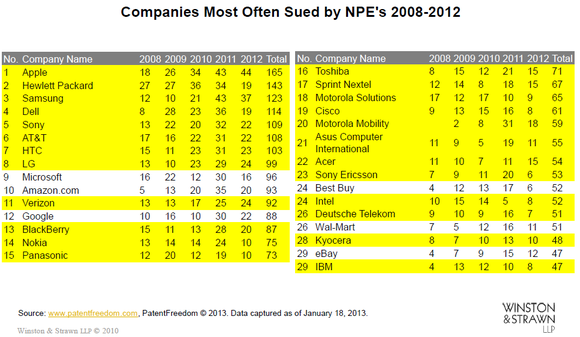 And the list of companies/patent trolls with lawsuits against Apple is very long.